“Mr. Silayan, I would like to do a documentary on your career as an actor.” “A what?” came his voice over the telephone. “A documentary – on your life.” This was June of 1984. Sadly, he was perplexed at the idea of committing his life story for the screen. He didn’t know who I was and my request was even stranger. He hesitated for a few seconds. “Why don’t we talk about it. Are you busy right now?” “No,” I replied. ‘Why don’t you come over?” I got on the first bus to the Villamore Driving Range. It was his “office.” People who needed to get in touch with him called or went to this place. When I arrived, he was watching some golfers practice. Later, I found out that he spent most of his time in the driving range just watching. “I’m not allowed to play. I haven’t played in two years. Doctor’s orders, you see.” His heart trouble prevented him from doing a lot of things. Including accepting certain movie roles. But despite his precarious health, he persisted on taking certain risks. For instance, he drove his own car. I introduced myself as a preservor of films from De La Salle University. Our first meeting, a short one we both assessed, stretched to four hours. He was a fascinating storyteller. With some prodding, he unleashed a storm of details about his youth, his experiences in the war and his work in the movies. He capped the meeting with a fervid account of his close brush with death which happened towards the end of the second world war. “I was talking to a group of friends when a bomb exploded a ten meters away from where we were seated.” He was 16 at that time. “I remember getting up from my seat when the explosions came. As I was being helped back to the house, all I could hear was a sharp ringing sound in my ear. As we entered, my sister saw me and they started screaming. Later, they told me that while I was trying to explain what has happened, blood was profuse coming out from mouth.” he has shown wound all over his body. His right leg got partly burned and he lost his toenails. I remember the day flies crawling on the wounds on my upper legs. (later, he grew a mustache to cover the scar.) I was brought to San Lazaro where the doctors tried pulling the steel wires that got embedded in my chest. They pulled me up as they tried to pull out the wires.” Born in Manila on Jan. 31, 1929, Vic Silayan is unquestionably one of the finest Filipino actors of this century. A Bachelor of Arts graduate from Ateneo, 1951, he once said that his education had a strong influence on his acting style. As an actor, he is a multi-media talents: be excelled on stage, on radio, on TV and in film. “Acting came naturally to me.” He had done Shakespeare, Arthur Miller and even Broadway musicals. In the times that we met during and after the making of the documentary, he often talked about his own feeling about performing and creating character before an audience. Among his early plays, Cyrafina J. Bergerac (1952), where he did the starring role, comes foremost to mind. “I remember the applause even though one is exhausted, the applause fills the heart. I remember Carlos P. Romulo being in the audience. I also remember Hilarion Henares, Sr. talking about Jose Ferrer’s Broadway performance and how I compared to it; he said the limited budget did not diminish the impact of my performance at all. I only overheard it and I cried in the dark.” A legend in his own time, Vic Silayan’s film career began in 1953 when he was cast by director Lamberto Avellana to appeal in the role of a PC captain in the film Huk sa Bagong Pamumuhay. Since then he has appeared in over 300 films some of which where foreign production. Often, he was cast as a bad guy, a part which according to him, is more difficult to portray. Needless to say, he was a victim of typecasting – for a time he was the film industry’s favorite Japanese officer. But it’s to his credit that he has managed to make a mark in several Filipino classic. Among them are Anak Dalita, Badjao and Malvarosa. However, he is best remembered for his role of a psychologically imbalanced retired policeman in Mike de Leon’s Kisapmata. In the film, he portrays an over possessive father who murders his whole family and eventually kills himself. “I didn’t like the person I portrayed in that film,” the actor once said. “There have been bad-men roles that I liked. But that one I didn’t like. May diperensiya siya. He was mean to other people who couldn’t fight back.” Nonetheless, it was performance that earned him an Urian best actor award, his second. (In 1983, he won best supporting actor honors for Marilou Diaz Abaya’s Karnal.) Aside from his work as an actor, many remember him for the rich, deep quality of his voice. Yet, he is modest about it. Paano Ba Ang Mangarap (1983) – Vic Silayan played the husband of domineering snotty rich, Armida Sigueon Reyna and Vilma Santos played the unwed pregnant fiance of their son, played by the late Jay Ilagan. Sinasamba Kita (1982) – Vic Silayan played the rich death-stricken father of Vilma Santos whose last wish is for Vilma to find her illigitimate daughter played by Lorna Tolentino. Karma (1981) – Vic Silayan played a hypnotist/psychiatrist who explained to Ronaldo Valdez the concept of reincarnation. Vilma played the lover of Ronaldo Valdez. Langis at tubig (1980) – Vic Silayan played the judged who convict the bigamist, Dindo Fernando. Vilma played one fo the two wives Dindo wed.
Ang galing-galing mo, Mrs. Jones (1980) – Vic Silayan played a conniving politician who abuse, Mrs Jones played by Vilma Santos. Dugo at pag-ibig sa kapirasong lupa (1975) – Vic Silayan played a forgettable role in one of the four segments, so as Vilma. Ikaw lamang (1973) – Vic Silayan played the supporting role to the new team of Paolo Romero and Vilma Santos. Ito ang Pilipino (1966) – Vic Silayan played one of the major role in this Joseph Estrada-Barbara Perez film. Vilma Santos played a minor child star role with another child protege, Jay Ilagan. 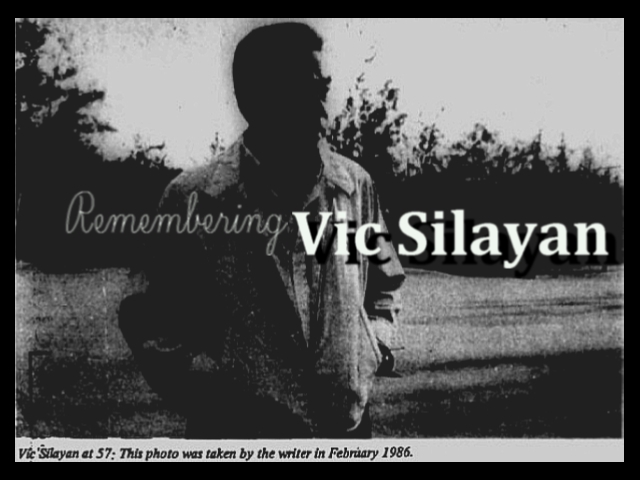 This entry was posted in ARTICLES, VIDEOS and tagged ARTICLES, Remembering Vic Silayan, Vic Silayan. Bookmark the permalink.